Published: Jun 2018 i Previous editions(s) can be found in the Related Items tab. Foreign Account Tax Compliance Act Answer Book provides a detailed analysis of FATCA and the requirements it imposes on foreign financial institutions (FFIs) to disclose annually information about accounts held by U.S. individuals, or foreign companies in which U.S. individuals hold a substantial ownership interest. Written and edited by Matthew D. Lee (Fox Rothschild LLP), this question-and-answer guide walks the reader through every aspect of the Foreign Account Tax Compliance Act (FATCA) requirements. The book explains FATCA terms and concepts, identifies which FFIs are covered by the Act (over 155,000) and which countries (over 100) have signed, or indicated their willingness to sign, bilateral tax treaties with the United States (called Intergovernmental Agreements), and describes the obligations placed upon FFIs under the Act. 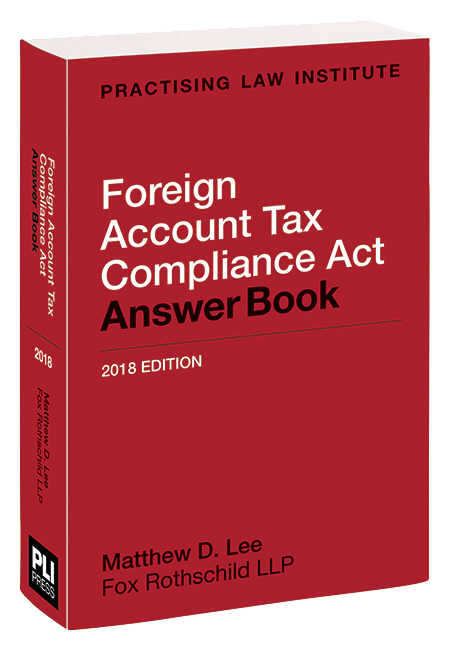 Additionally, Foreign Account Tax Compliance Act Answer Book provides guidance on how to create an acceptable compliance program and what is required to register as a foreign financial institution. Matthew D. Lee is a partner in the Philadelphia office of Fox Rothschild LLP, where he practices in his firm’s White Collar and Government Investigations and Tax Controversy practice groups. He is a former U.S. Department of Justice trial attorney who concentrates his practice on all aspects of white collar criminal defense, federal and state tax controversies, financial institution regulatory compliance, and complex civil litigation. Mr. Lee has represented both corporations and individuals in criminal investigations involving tax, money laundering, health care, securities, public corruption, and fraud offenses, and has significant experience in handling all stages of state and federal litigation, including trials and appeals. He has represented individuals and companies in all stages of proceedings before the Internal Revenue Service, including audits, appeals, and collections, as well as Tax Court and district court litigation. Mr. Lee has significant experience in conducting corporate internal investigations and advising banks and financial institutions as to compliance issues involving the Bank Secrecy Act, the U.S.A. PATRIOT Act, the Foreign Account Tax Compliance Act (FATCA), antimoney laundering laws and regulations, and economic sanctions. He also represents financial institutions and individuals in enforcement proceedings brought by the Treasury Department’s Financial Crimes Enforcement Network (FinCEN). Mr. Lee also advises clients on issues regarding foreign bank account reporting (FBAR) obligations, FATCA, and the Internal Revenue Service’s 2009 Offshore Voluntary Disclosure Program, 2011 Offshore Voluntary Disclosure Initiative, and 2012 and 2014 Offshore Voluntary Disclosure Programs. He has represented hundreds of U.S. taxpayers with undisclosed foreign bank accounts, has published numerous articles regarding the IRS voluntary disclosure programs and FBAR and FATCA reporting obligations, and speaks frequently on these topics. Mr. Lee publishes a blog entitled Tax Controversy Watch (www. taxcontroversywatch.com) which provides timely reviews of the latest developments in the tax controversy field, including criminal tax investigations and prosecutions, civil audits, appeals, and collections matters, and Tax Court and district court litigation. Mr. Lee has also served as a Lecturer of Law at the Villanova University School of Law. He graduated with honors from the Emory University School of Law, where he was elected as Executive Managing Editor of the Emory Law Journal. He earned his undergraduate degree from Furman University.